I can almost guarantee the problem is Camera Studio. It's been there since at least 1.5, I thought it only happened while you were on a path or traveling but it's possible it breaks Tiling all the time. Not even sure if the FBO in 1.7 will fix it. I know it didn't happen way back in 1.2.5 though. I can almost guarantee the problem is Camera Studio. You are right when i take away the camstudio mod i can take the picture. quite annoying. but it cuts down at least on the search for the problem i guess. 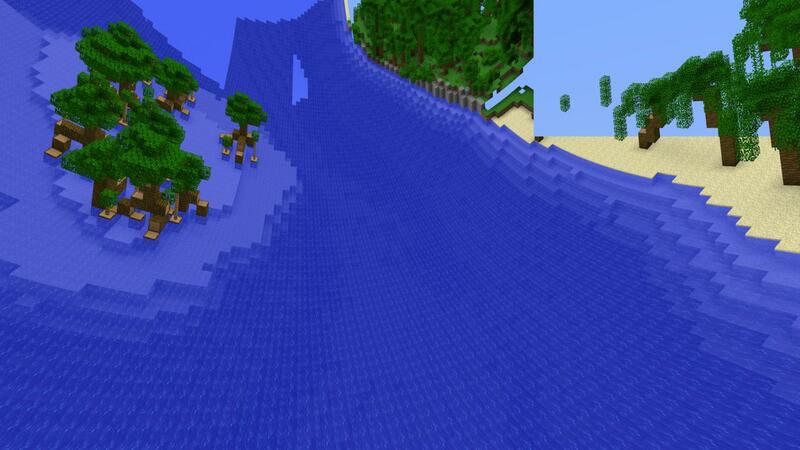 I would not like to restart minecraft a lot just for a mod. for now i will stuck with it, but barracuda knowing he will find a solve for this. It's the Vignette from the shader, you should be able to turn it off. The Vignette is a pixel shader and should work on 1.7. You'll have the same problem with effects like Bloom and SSAO until you update to 1.7. Also the it broke the reflections if you hadn't noticed. Yeah, I can confirm that. Strangely, there are no error or warning messages, so I guess camera studio constantly overrides the camera settings. But yeah, the FBO capture could fix that, since it doesn't have to change the camera settings, unlike tiled rendering. I'm very sure it does, at least the timer doesn't change during capture. But shaders may run asynchronously in the background and independent from the game timer. Maybe, I first have to find a more elegant way to load all visible chunks at once. In Minema, I had to override half of the functionality of a Minecraft class to get the desired result and I'm almost sure it won't work in 1.7 anymore. Since I've never seen anyone else complain about the first problem, and the workaround isn't even very tedious it's that big of a deal. It's happened in almost every picture I've taken, and the fact that most areas are still intact tells me it's a bug. 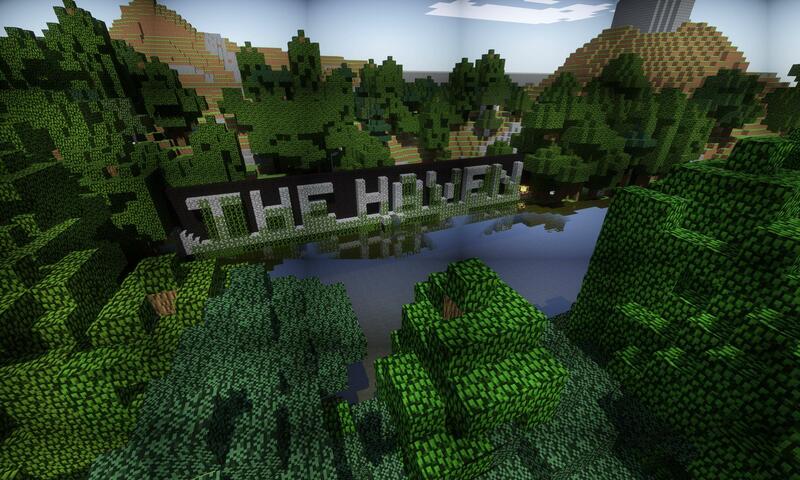 Probably just the FBO being implemented by Mojang, but perhaps you could get to the bottom of it. I can't change the resolution on Mac. Is there a way to do it manually, changing the files? 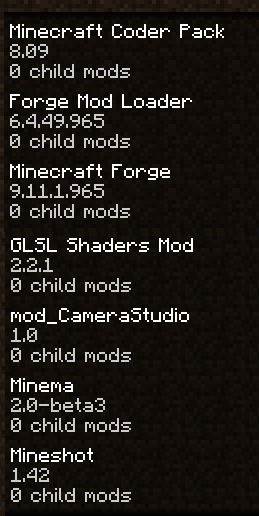 You can't change the resolution if you are using v1.5 (MC 1.7.x). Barracuda, is it possible to have signs rendered? Other than that, this mod is perfect. Thank you :). It's a really neat mod by itself, but I have to say it. ProfilerEvents is horrible. It impacts the performance quite a bit, instead of a simple if-enabled-doProfiling() call it's constructing hashmaps and stuff. It also results in crashes like this and this, which don't happen with vanilla. Since you're only ever using the events it fires for the frustrum call you should consider adding an event for that to Forge directly. If you want I can get a PR going for that. Yeah, I also noticed that it's a bad idea to use Forge's generic event bus for very frequently fired events when many mods are installed, so it's using its own independent event bus in 1.6 now. I'm also working on a Minema version that doesn't require profiling events in order to work. However, there's no forge event that is fired at the right time to change the projection matrix and perspective mode, which is required for the orthographic camera, so I currently don't see a better way for Mineshot. But I'll have a look at the concurrency issues to harden the code of the profiler proxy. Edit: actually, EntityViewRenderEvent.FogDensity does the job quite well. So I guess I can get rid of the code. Have you considered making this a litemod? You have access to which is extremely powerful and could easily replicate the functionality you want without any noticable overhead. Since this is a client-only mod it's a prime candidate. LiteLoader itself used to use profiler injection as its method for callbacks, but since the inception of the Mojang Tweak System it's possible to do some quite interesting things using dynamic bytecode injection. See my latest edit, one of the Forge events actually works fine, so there's no need for bytecode edits. But I may use it for the next Minema version, because there are some issues with vanilla classes where the typical reflection hacks definitely won't work. Heh no worries, just putting it out there as a suggestion. Pretty old post but I thought I'd add, I figured out what the problem was, and it had nothing to do with a faulty FBO, so no worries. I've just found this mod. I'd like to use it to take mob and block images for our Galacticraft wiki, but I have a question: How can I take consistent isometric screenshots? The problem I'm having is like this: place a block, Num5, Zoom In, take a pic, back to normal; place another block, Num5, Zoom In, take a pic. Then I compare both images, I notice the zoom levels between both pics are different, and it's not easy to set an uniform zoom level for all images. If I resize the images in an editor I'll get some visual glitches. I'd like to avoid doing this. How could I set an uniform zoom level so that all screenshots will be consistent? It would be cool if the Mineshot Settings had an "Initial Zoom Level or Distance: <float>" so that when I hit Num5 the camera will be positioned exactly where I want. I can do the rest.